Honda's 2019 Ridgeline delivers the comfort and driving familiarity of an SUV, with the flexible versatility of a midsize pickup truck. The Ridgeline's open bed is cleverer than that of the Nissan Frontier, Chevrolet Colorado or Toyota Tacoma, providing a hidden compartment beneath the bed floor for stowing items safely out of view. The ridgeline revs my Soul. I love my new ridgeline. It drives beautifully - it turns corners well and rides smoothly. It does not even feel like I am driving a truck. The seats are very comfortable. I am fairly short, but the seats are easily adjusted so that I can reach the pedals and steering wheel without stretching (the steering wheel can also be adjusted up, down, or closer to the driver). I also like the armrest on the right side. I love many of the features that come with the car. The backup camera is very useful. I also love the side view camera (passenger side). It is so helpful in checking that blind spot. I also love the built in GPS (not only does it show up in the middle panel, but it also gives you arrows and shortened directions on the driver panel so you can easily see where to go). It was very easy to pair my phone with the car so that I can make hands free calls or play music. The one problem I have had is trying to send a text hands free. I have not been able to actually get the texts to send (which admittedly is probably something I am doing and not the built in Siri). Other than that, I have not yet encountered any problems. I absolutely love the truck and I am so glad we bought it! My vehicle is a 2019 Honda Ridgeline in the color pearl. Super reliable and performs extremely well! The pick-up trunk has a built in cooler and it is an extremely smooth ride. It feels a bit bulky at first if you are accustomed to driving sedans but that just may be a personal adjustment and nothing to do with the car itself. Overall, so happy we decided to purchase this car! It is a great product for anyone. . It is reasonably priced and is economical. Good looking vehicle. Feels comfortable to drive. I feel safe. It is spacious yet it fits in my garage. Has all of the options I need for a great drive in town and on the highway. Good gas mileage and handles tremendously. 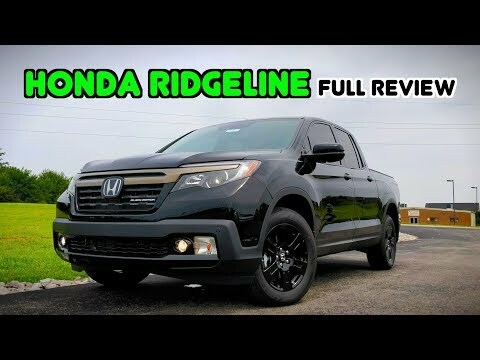 2019 Honda Ridgeline: FULL REVIEW + DRIVE | A Truck Like No Other! Honda (American Honda Motor Co.) is recalling certain 2019 Honda Ridgeline and Pilot vehicles. The mounting holes for the clip that secures the right center pillar trim panel may be larger than intended. In the event of a crash necessitating right side curtain air bag deployment, the clip may not hold the center pillar trim panel in position and it may potentially interfere with the curtain air bag deployment. As such, these vehicles fail to comply with the requirements of Federal Motor Vehicle Safety Standard (FMVSS) number 214, "Side Impact Protection," and 226, "Ejection Mitigation." In the event of a crash, if the curtain air bag does not deploy as intended, it can increase the risk of injury. Honda will notify owners, and dealers will install a bracket on the right center pillar that will securely hold the center pillar trim clip, free of charge. The recall is expected to begin January 25, 2019. Owners may contact Honda customer service at 1-888-234-2138. Honda's number for this recall is D3D. Honda will notify owners, and dealers will replace the SRS unit, free of charge. The recall began November 8, 2018. Owners may contact Honda customer service at 1-888-234-2138. Honda's numbers for this recall are B2R, C2P, and Z2Q.